It does this by displaying several of the events, maps and characters used in the game. 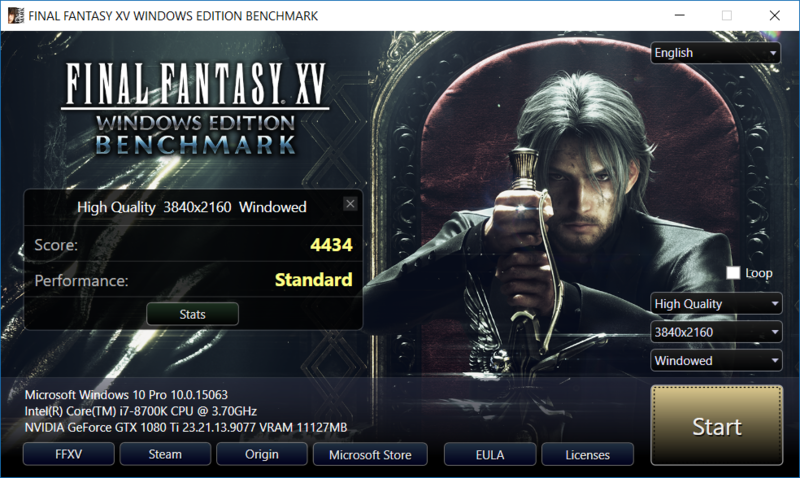 The FFXV Official Benchmark launcher will boot up when you click on " Official Benchmark" from either the Windows start menu or a desktop shortcut. After adjusting the various settings, push the start button to initiate the Benchmark compatibility test. 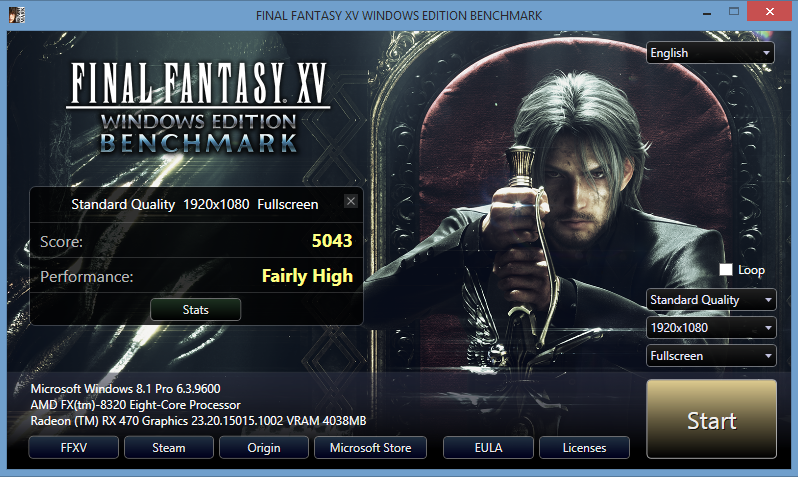 For the insiders, this benchmark and title does have Nvidia game works written all over it. An OS with the Windows 10 Creators Update or later and a compatible monitor are required to use HDR display. * An NVIDIA graphics card is required to run NVIDIA Ansel. The benchmark seems to be inconsistent on my RX 480 (jumping from 20fps to 80fps , then back to 20fps) , and there are tons of graphical glitches (missing textures , shadows randomly appear and disappear) . - The problems mentioned above were caused by Freesync . I disabled Freesync , and everything ran fine afterwards . fx 8350+gtx 1080: considering i'm bottlenecked i didn't expect such good results: 1920x1080 high,af16x,max performance gpu profile, v-sync application controlled i scored 7100(7400 was the reference score for my gpu) and i got the high mark. I tried also 4k on high and i scored 4100 and got a standard mark. On my desktop I scored over 7000 with my maxed out OC GTX 1070 (+105core +500 mem) and I was getting flickering and some artifacts and thats @ 1080p High settings but when I actually play GPU intensive games I got none of that. On my gaming laptop with a GTX 1060 6GB with a light OC on high settings I was getting occasional freezes. Thanks for the info Will give it another go. Yeah, I had to make a new profile in nvinspector then adjust power and frames 2, threaded opt on.. to go from stutter to slight jitter at those scenes, it goes away completely if you run it 2x. As for artifacts, lower vram or gpu Oc.. try 3dmark 2011 test 2 and 4 @Extreme setting.. that is a quick indicator.. especially for vram, next skydiver in new 3d mark. Even if it was, most enthusiasts have a more modern machine that is DX12 capable. As for artifacts, lower vram or gpu Oc.. try 3dmark 2011 test 2 and 4 @Extreme setting.. that is a quick indicator.. especially for vram, next skydiver in new 3d mark. The oddest thing during Standard game play of GPU intensive games I don't get any flickering or artifacts of any kind and I did try rerunning the benchmark at stock speeds +0 on both core and mem and I didn't get any flickering or artifacts. I did run the newest 3dmark when I got my repaired card back and it was stable and the same thing goes with the Valley Benchmark as well. The oddest thing during Standard game play of GPU intensive games I don't get any flickering or artifacts of any kind and I did try rerunning the benchmark at stock speeds +0 on both core and mem and I didn't get any flickering or artifacts. I did run the newest 3dmark when I got my repaired card back and it was stable and the same thing goes with the Valley Benchmark as well. Well, standard is still less demanding.. That's why I also suggested 3dmark11 extreme present instead of standard. I think that vram oc is a bit too much, or a combo of both. Minimal 10-20mhz adjustments. DX12 is fine but ofc mGPU support is not present. That would be a miracle specially been a Japanese console port. I think that vram oc is a bit too much, or a combo of both. Minimal 10-20mhz adjustments. Well I stand corrected. My OC was not stable and I was able to get it stable @ +75 on the core and +380 on the mem. From +105 and +500. If anyone wanted to compare against my system, I'm sure most will beat it. HDR works very nice in this benchmark. On my i5 stock clock with R9 290 I've got score 4300. Boost my i5 at 4.45ghz and i got lower score wich is 3800. And now I'm officially confused, can some one tell me what the hell happened. And now I'm officially confused, can some one tell me what the hell happened. Hmm that is odd. Alot of people here and other places are saying that the game isn't optimized yet and there might be a game ready driver for the game when the game is released or Just before. Hmm. Clearly if they can release the game optimised then all will be well. The demo is basically on par with Farcry primal which is now nicely optimised. The Demo as in un-optimised requires no where near as much resources as resident evil7 or Rise of the tomb raider and yet still runs fairly poorly. Looks like my spec is lower than 1070 result from the official statistics.. Sorry that was for my 4k run at High. at 1080p im right behind the Titan V.
Hah, I knew there was something fishy going on, but this bad? .. fail. It's only the highest setting that uses gameworks though isn't it?